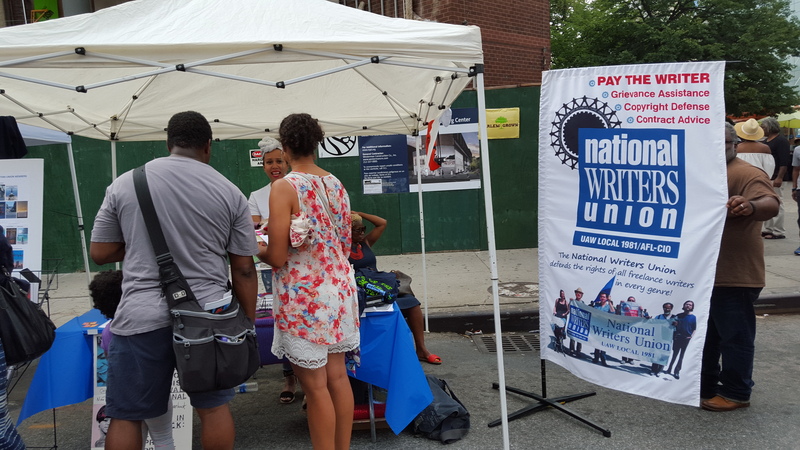 New Yorkers attending this year’s Harlem Book Fair, one of the largest writers’ events in the city, reflected the diversity of the NWU’s members. On Saturday, July 16, 10 members displayed their recent works along with information about the union, including our new membership brochures, buttons, and “Workers of the WORD, Unite” T-shirts, some of which found new owners. Located next to a stage used for author talks, our booth benefited from a wealth of foot traffic. NY Steering Committee member Peter Benjaminson was a popular author with his two Motown biographies. Other long-time members, Jo Anne Meekins, Cathie Wright-Lewis, Jeffrey B. Perry, and Yvonne Hilton, met new members. Visitors stop by our booth. Offering table space at the fair has proven to be a great way to recruit authors, too. Gina Humber expressed gratitude that she saved hundreds of dollars by not having to rent her own table. 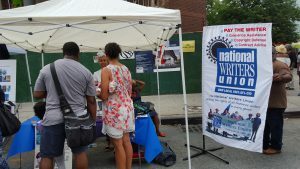 New members, Izzy Church, Deloris Cook and Jane Mushabac, enjoyed fellowship with other NWU writers, and most said they planned to gather again under the NWU banner at the Brooklyn Book Festival. As part of our continued outreach to the Harlem community, New York co-chair Yusef Salaam and Cathie Wright-Lewis are working with organizers of the Harlem Book Fair to host a “Black Writers Matter” panel discussion in the fall.